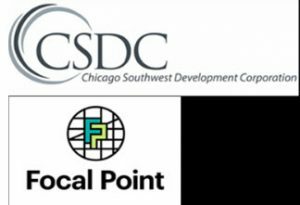 This article originally appeared on the Federal Reserve Bank of Chicago’s Community Development and Policy Studies blog on December 19, 2018. As part of our Healthy Communities Initiative blog series, we highlight the role of regional Federal Reserve Banks in supporting and enabling cross-sector collaboration across the community development and health sectors. 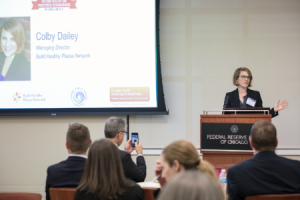 The Community Development and Policy Studies (CDPS) division of the Federal Reserve Bank of Chicago, in partnership with the Build Healthy Places Network (BHPN), Illinois Public Health Institute (IPHI) and County Health Rankings and Roadmaps, hosted an event titled Building Healthy and Prosperous Neighborhoods in Cook County on November 15, 2018, to motivate collaborations between healthcare and community development in Cook County, Illinois. 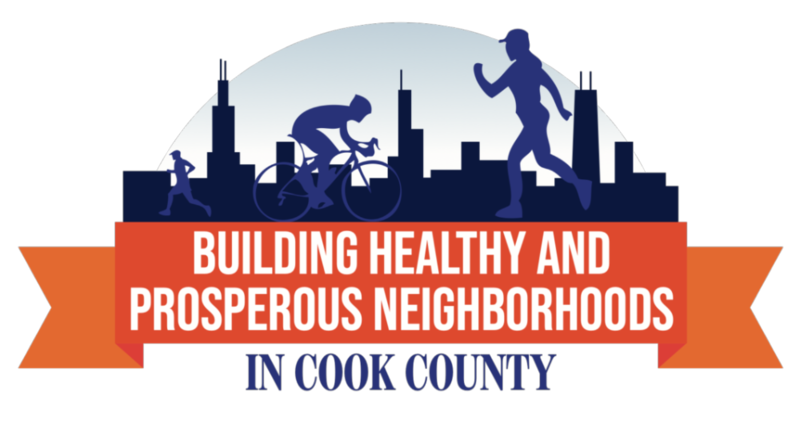 The purpose of the meeting was to understand where and how the public health and community development sectors were collaborating to improve health outcomes in Cook County. More specifically, according to Jeremiah Boyle, assistant vice president and managing director of Community and Economic Development at the Chicago Fed, organizers sought “to mitigate inefficiencies that were resulting from working in the same communities, often having noted the same challenges, but without effective collaborations.” The call to action was for public health officials, healthcare professionals, and community development corporations (CDCs) to join forces to increase cross-sector investments and collaboration in low-income neighborhoods. 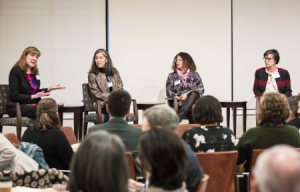 Community-based interventions that address the social determinants of health – such as race/ethnicity, income, access to credit, housing quality, crime and safety, and pollution – may help translate collaboration into action as outlined by multiple speakers at the meeting. Develop a more strategic and accelerated approach to launching initiatives between healthcare and community development in Cook County. Colby Dailey, MPP, speaking at the Chicago meeting. Four afternoon breakout sessions featured local collaborations between health partners and their communities to address specific social determinants of health. Flexible Housing Pool is an innovative source of public-private investments to offer supportive housing to people most at need. A county-wide public-private partnership, Flexible Housing Pool (FHP) works with community partners such as Cook County Health, UI Health, Chicago Department of Family & Support Services, Chicago Department of Public Health, Housing Authority of Cook County, and Illinois Public Health Institute. FHP seeks to stabilize housing for individuals who have been homeless with high behavioral health and physical health needs who are most at risk of using high-cost emergency services. The city of Chicago has committed $1.8 million to the program. Saint Anthony Hospital is partnering with the Chicago Southwest Development Corporation (CSDC), residents and over 100 community groups to serve individuals and families who are impacted by poverty, trauma, violence, discrimination, language barriers, and limited health access in the neighborhoods that surround the hospital on the West and Southwest sides of Chicago. Saint Anthony will build its new hospital on a 32-acre campus at 31st Street and Kedzie Avenue, and will offer a range of retail, wellness, education, arts and recreation, and affordable housing services to improve the health and well-being of the community and its residents. The total project cost is $500 million. Serving the communities of Maywood, Bellwood, Broadview, and Melrose Park, PP4H is funded through a five-year seed grant from Trinity Health and is focused on economic mobility for youth, improving food systems, and access to healthcare. In partnership with Loyola University Health System and Loyola University Chicago Stritch School of Medicine, PP4H is addressing racial, health, and economic inequities in the Proviso communities. By addressing disparities in health equity, WSU intends to coordinate investments and share outcomes to “build healthy, vibrant neighborhoods.” In partnership with healthcare providers such as Ann and Robert H. Lurie Children’s Hospital of Chicago and Rush University Medical Center, as well as education providers and community based organizations, WSU seeks to invest $2.5 million in initiatives from housing to youth services and $100,000 in small business grants. Metrics and data to document inequities can drive targeted, strategic approaches to areas with significant needs. Multi- and cross-sector investment initiatives highlight the consequences of poor health and poverty on community residents, but also the opportunity for effective collaboration. These collaborations demonstrate the potential of cross-sector investments to help low-income communities address their needs. National and local examples of public health-community development collaboration are relatively new, are beginning to bear fruit, but remain areas of innovation. Convenings such as Building Healthy and Prosperous Neighborhoods in Cook County provide unique opportunities to convene a broad spectrum of actors around this developing topic. 5 Healthy Communities: A Framework for Meeting CRA Obligations, available online. Susan Longworth is a senior business economist in the community development and policy studies division at the Federal Reserve Bank of Chicago. Prior to joining the Fed in 2011, she had over 20 years of community development experience, with a special emphasis on community development financial institutions and community banks. She holds an undergraduate degree in English from the University of Michigan, a master’s in public service management from DePaul University and an international MBA from the University of Chicago. Maham Ali is an intern in the Community Development and Policy Studies Division at the Federal Reserve Bank of Chicago. She is a senior majoring in International Political Economics at Carthage College.